A monorail passes Journey into Imagination’s Reverse Waterfall as Illuminations fireworks explode overhead.Nikon D700/Tokina 11-16mm, 15.7s, f/9, ISO 400, EV 0, 16mm Focal Length, Tripod. Scott is taking this week off to enjoy Fourth of July festivities which will include fireworks. It reminded him of this photo of a monorail passing Journey into Imagination’s Reverse … Continue reading "Fireworks and Monorails at Epcot"
To all my fellow US of A citizens, hope you all had a nice Thanksgiving. Did you put up your Christmas lights yet? Each year I like to share my past articles on how best to photograph holiday light displays at home and in a Disney themepark or resort. 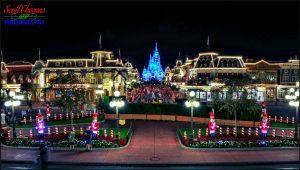 First, I would like to share … Continue reading "Reviewing the Photography of Holiday Lights at Walt Disney World and Beyond"
The new Happily Ever After Fireworks and Castle Projection Show in the Magic Kingdom is wonderful, beautiful, uplifting, emotional and a visual and musical delight. But, for a still photographer, like myself, it is extremely challenging. I like my firework photographs to have colorful long streams and bursts. For the previous fireworks show, Wishes, the … Continue reading "Photographing Happily Ever After in the Magic Kingdom"
Photographing Pandora – The World of Avatar in Disney’s Animal Kingdom at night poses many challenges. The first one I was lucky to avoid having visited just after Hurricane Irma had passed and attendance was way down. People will be everywhere with long lines for the two attractions which will test any photographer’s patience. Having … Continue reading "Photographing Pandora at Night in Disney’s Animal Kingdom"
Out in front of the Pongu Pongu beverages and Windtraders store is a RDA Combat Amp Suit standing guard. I found it an interesting contrast to the peaceful scene found in most of Pandora. RDA Combat Amp Suit in front of Pongu Pongu and Windtraders in Pandora.Nikon D750/16-35VR, 30s, f/8, ISO 100, EV 0, 16mm … Continue reading "Disney Pic of the Week: Pandora At Night"
Here is a simple study on the effects of shutter speed when doing long exposures. As I waited for the projection and firework shows, I photographed Cinderella Castle in the Magic Kingdom using longer and longer shutter speeds. Each photo was taken with a Nikon D750 full-frame digital SLR camera using a Nikon 24-120mm lens … Continue reading "Cinderella Castle Study in Long Exposures"
On my trip last week, I was on my own Friday at the Magic Kingdom. Using an app on my phone, I had determined a location to photograph the sunset. It was from the bridge on the Wishing Well side of Cinderella Castle. With the sunset at 7:38PM and Wishes starting at 9PM, I set … Continue reading "Anatomy of a Magic Kingdom Sunset"